Coming from a Chinese-Filipino family, I've already gotten used to eating Chinese cuisine whenever we're out. Honestly, it has become a drag since we always get the same dishes almost every time, even in different Chinese restaurants. However, I've recently discovered Hai Kang Seafood Restaurant which boasts of new and exciting dishes for the youngsters like me, while still carrying the tried and tested Chinese favorites. 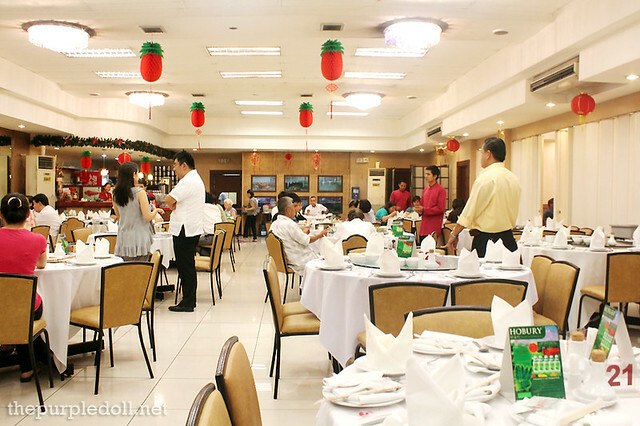 Located along Wilson Street in Greenhills, Hai Kang Seafood Restaurant is a twelve-year old Chinese dining destination formerly known as Harbour City Restaurant. And while it changed its name three years ago, its time-tested menu remained to carry the same flavorful Chinese fare that its loyal patrons love. However, as the Chinese community evolved to include an adventurous bunch, Hai Kang Seafood Restaurant has decided to add new and modern items sure to satisfy the foodies of this generation. To start off, we had the Seafood Pumpkin Soup (S P500; M P750; L P1,000). While seafood is already a staple in Chinese restaurants, this is my first time to have tried one which is infused with the hearty goodness of pumpkin. Unlike the pumpkin soup in most Western cuisine restaurants, this bowl is not too thick nor too heavy yet very smooth, earthy and calming on the palate. It also has generous amount of shrimps, scallops, clams, squids, crab sticks and fish, perfect for seafood lovers like me. We then had the Eggwhite Seafood (S P600; M P900; L P1,200) which is a light, fluffy and airy ensemble of egg whites, assorted seafood shreds and pork floss. While I wouldn't normally go for an egg white item, I really liked how flavorful this simple dish is. Aside from being satisfying taste-wise, it's also healthy and wouldn't mess up your diet. My favorite for the night are these Laksa Prawns with Fried Mantou (P180 per piece). While everything we got to try was out of the ordinary when it comes to Chinese restaurant dishes, this serving was the most unusual yet the most satisfying. 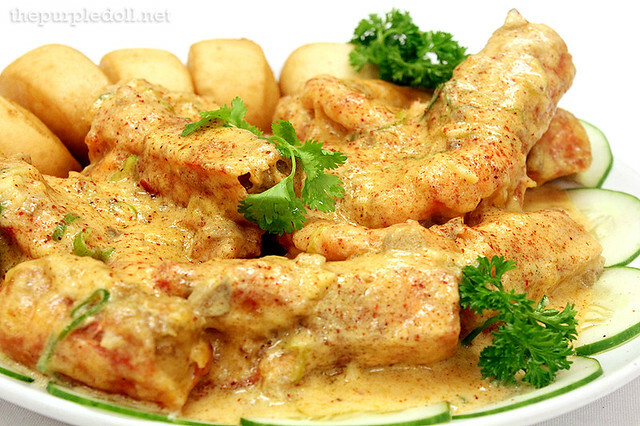 Each prawn is plump and very succulent with a thick coating of the rich, savory, spicy and coconuty laksa sauce. Seriously, never leave the restaurant without ordering this! 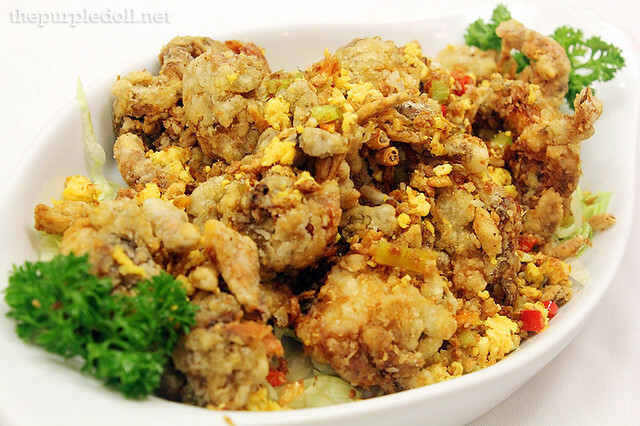 Runner-up is the Soft Shell Crab with Salt & Pepper (S P600; M P900; L P1,200) which comes breaded, crisp-fried and served with salted eggs. Although this dish may look simple, it definitely tasted amazing and really had me digging in. It was flavorful, very well-seasoned and with a harmonious blend of savory, salty and peppery. We also had the Fried Tao-Pe Roll with Country-Style Sauce (S P500; M P750; L P1,000). While you may think that this is just your regular spring roll, don't be fooled. 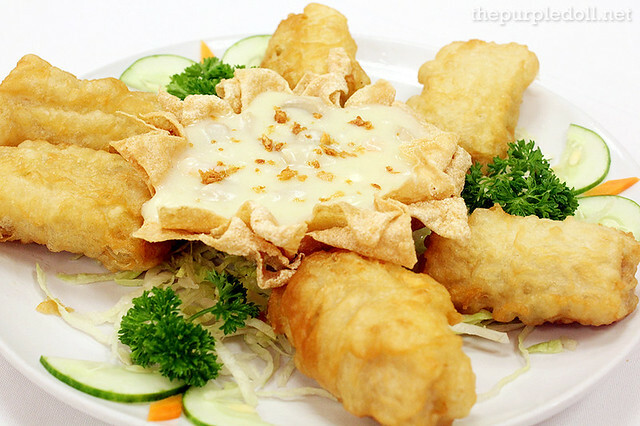 Instead, these are minced pork covered with fried bean curd skin, and served with a rich and creamy shrimp, potato and mushroom sauce. Every bite unlocks not just an explosion of flavors, but also a lovely crisp yet delicate texture from the bean curd skin. Last viand for the night was the Shredded Beef Tenderloin Strips with Japanese Sauce (S P600; M P900; L P1,200) cooked with onions, flat beans and cut corn cobs. 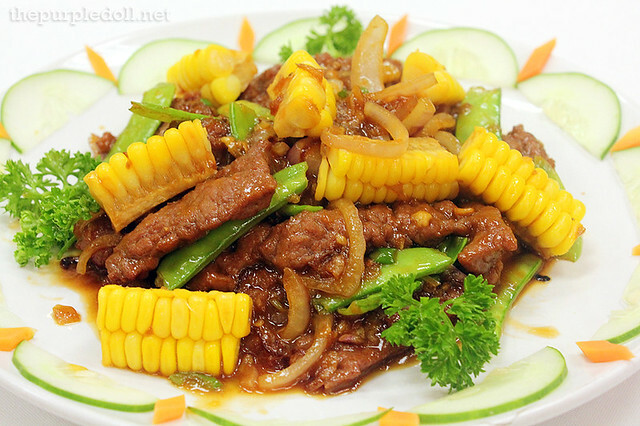 And while beef tenderloin is already a regular on most, if not all, Chinese restaurants' menu, Hai Kang updates this time-tested favorite by using its own recipe of a Japanese sauce which is generally sweeter than most salty Chinese-style beef tenderloin sauces. To cap off our meal, we veered away from the regular mango sago and went with a comforting Hot Almond Soup Dumpling (S P250; M P375; L P500) instead. Being a big fan of everything with almonds, I was glad that this bowl really tasted like almond, just sweetened. 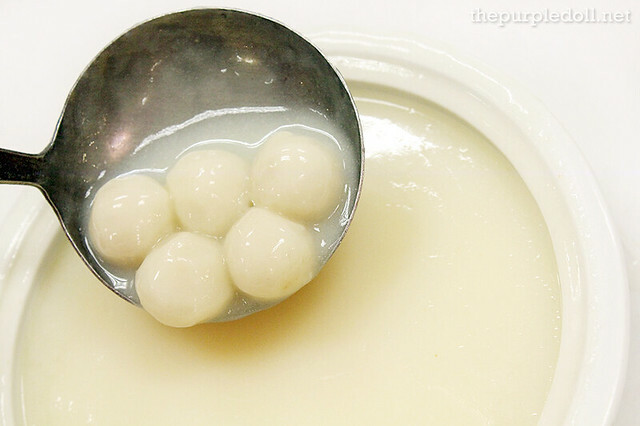 It also had sticky rice balls which complements the hot soup really well. We also had some Masachi (P80 per 4 pieces) which is similar to buchi, but contains black sesame paste instead of lotus or red bean paste. 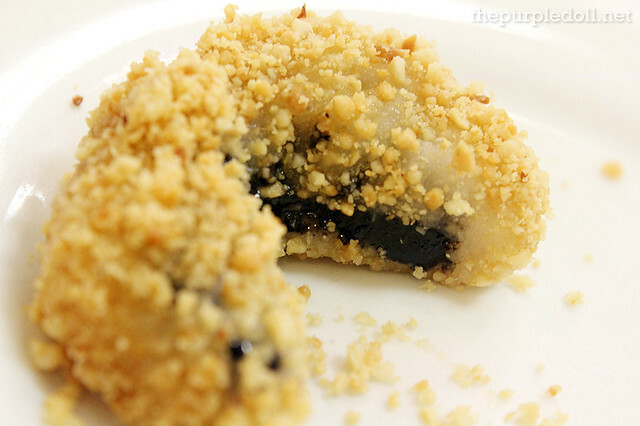 They're also not covered with white sesame seeds, but are crusted with finely chopped peanuts. 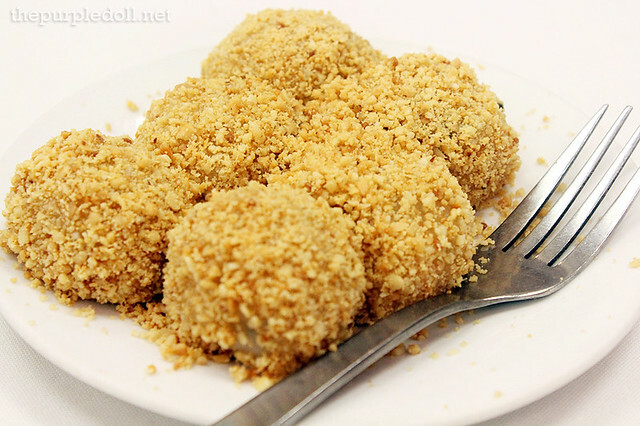 And while I personally prefer this than buchi, make sure to eat with care 'cause these treats can stain the teeth. If you've been a regular reader, then you've probably known how much I try to avoid eating in Chinese restaurants because of taste fatigue. However, after this trip to Hai Kang Seafood Restaurant, I've realized that I can still enjoy our family visits to Chinese restaurants, especially those that offer new and exciting modern takes on Chinese fare. And since Hai Kang still carries its tried and tested dishes on top of the newer ones, I can get my fix while the rest of the family can enjoy their good ol' Chinese favorites. Wow I want to go there asap for the laksa prawns and tao pe. I live so near Hai Kang but haven't eaten there in years!! Time to go back. Go Ms. Leslie! :) Will definitely be waiting for your blog post when you visit Hai Kang again soon. Wow. sarap esp. the masachi ah! I want to try the Laksa Prawns with Fried Mantou. It looks really delicious and mouthwatering. 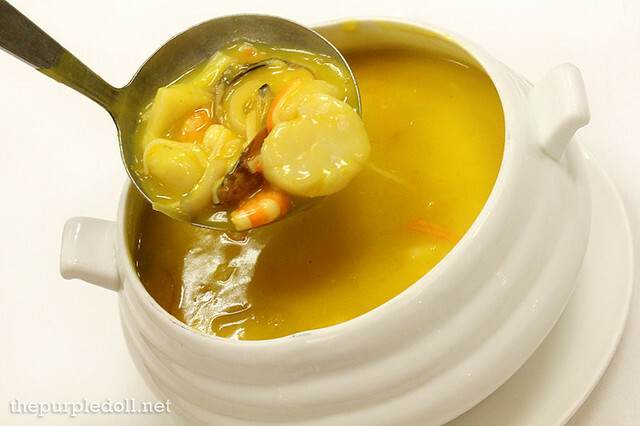 The Seafood Pumpkin Soup is just deliciously creamy. I love soups and this will surely satisfy my taste buds. "Sabaw pa lang... ULAM na!!" I love crabs so I would like to try their Soft Shell Crabs. They look like appetizers to me.. are they? How true. Day in and out, we are always looking for a food adventure although my family prefers Chinese food. Thank you for sharing, now I know where to look before going out on a food journey. This is a great find. I'm looking forward to trying this out when I'm in the area. I like the Shredded Beef Tenderloin Strips with Japanese Sauce. East meets west kind of dish. I Want to Eat Out, but.. but.. I'll be on GMA News TV's POP Talk on Oct. 9!